The Pit was transformed by PPD Special Activies for the Spring 2017 Commencement Ceremony. (l. to r.) PPD Special Activities team members Nick Royle, Kevin de Leon and Manuel Trujillo. 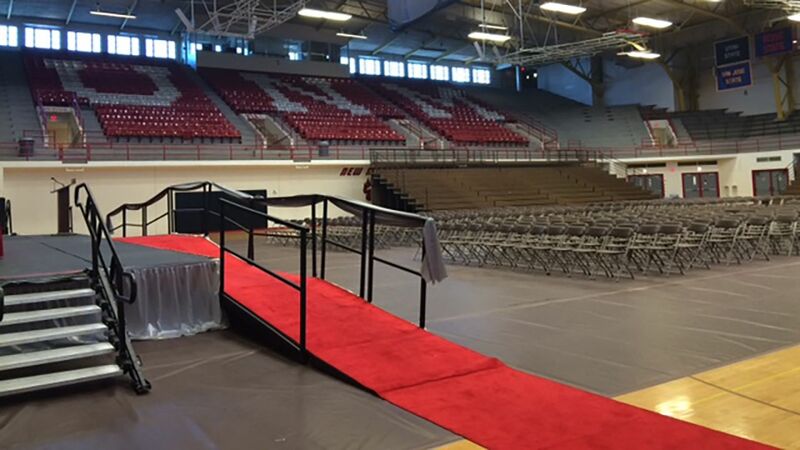 The Johnson Center College of Education and Anderson School of Management convocation set up. 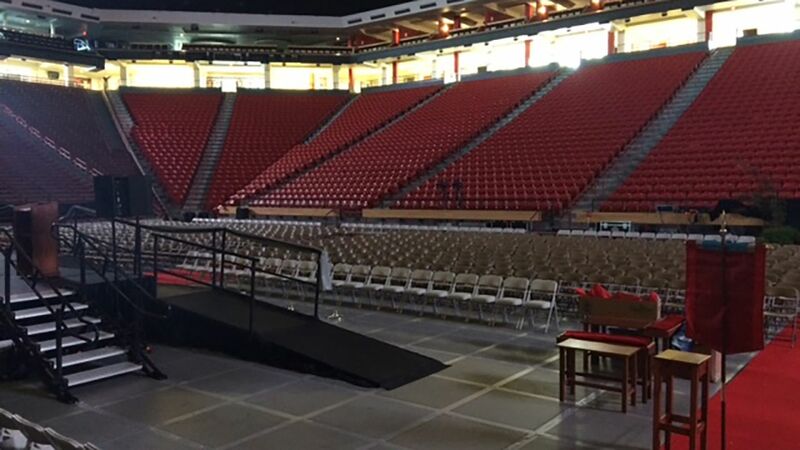 Twenty-one convocations, a University-wide commencement ceremony and numerous departmental celebrations were squeezed into just six days last week – a week which kept The University of New Mexico's Physical Plant Department’s (PPD) Special Activities unit very busy. With an inventory of approximately 2,250 folding chairs and 300 tables of various sizes available to rent, Special Activities was able to support all these events, while keeping University dollars on campus, and providing a level of service not found anywhere else. “We are like the magic elves on campus,” said Jessica Regensberg, Special Activities supervisor. Regensberg spent weeks taking customer orders and organizing the inventory along with the delivery and pick up schedules for finals week; Saturday, or “graduation day,” being the most intense. Local vendors are organized by Regensberg for staging and pipe and drape at Johnson Center, as well as additional chairs, tables, and tents for various convocations, in addition to the furniture for The Pit commencement set up. Regensberg described the week’s events as “challenging” with a small Special Activities crew, heavy traffic on surface streets, and a deadline of 1 p.m. for the College of Education (COE) convocation on Saturday. 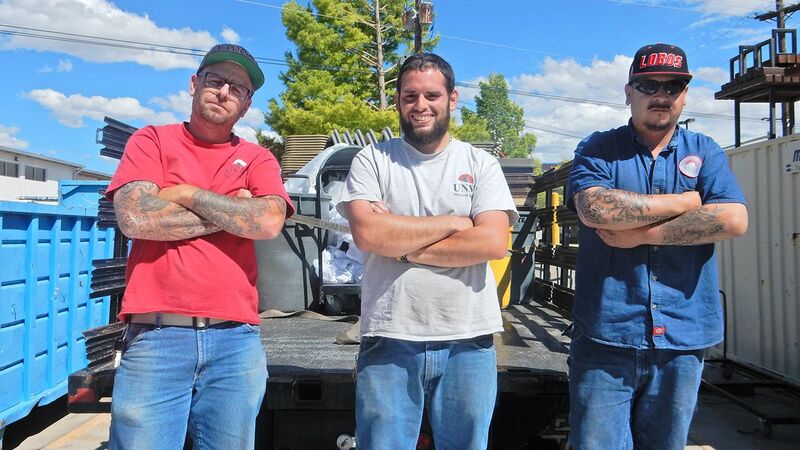 Regensberg said that a crew of eight PPD staff members worked on “graduation day” beginning at 8 a.m. to about 4:45 p.m.
PPD Special Activities provides support to the campus community for all special events and moving activities that occur on the Main, North and South UNM campuses. This PPD unit works year round to help departments plan and execute their events from small get-togethers, to large events such as UNM Commencement, Freshman Family Days and Welcome Back Days. To pull off the logistics with a small crew of three, PPD Grounds & Landscaping often offer assistance. Regensberg said it is important for the Special Activities unit to be competitive with outside vendors, and feels that the service they provide is superior because of their knowledge of the campus, low prices with no delivery fees (Main Campus only) and an in-depth knowledge of UNM’s policies and standards regarding events. They also have a working knowledge of the departments involved in event planning, such as Parking & Transportation Services, the UNM Police Department, Safety & Risk Services and Student Activities, to name a few. “Despite all the hard work, it’s worth it to see the graduates and their families happy and proud as they celebrate their accomplishments at UNM,” said Regensberg. To learn more about the services provided by PPD Special Activities, click here.